A couple of days ago I released HsQML 0.3.4.0, the long-awaited and much overdue next release of my GUI binding to the Qt Quick framework. You can download the latest release from Hackage as usual. 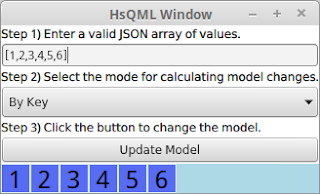 The major new addition in this release is the AutoListModel component, which you can import in your QML scripts from the HsQML.Model 1.0 namespace. This provides a way of creating QAbstractItemModels based on lists of items. This feature is some way off full support for creating custom models, but still a significant improvement over binding marshalled arrays to QML views directly. Namely, when the updating a list via the AutoListModel, it can generate item add, remove, and change events based on the differences between the old and new arrays. An direct array binding, on the other hand, would cause the entire model to be reset so that views lose their state, cannot animate changes, etc. This is demonstrated by the hsqml-model1 sample program included in the latest release of the hsqml-demo-samples package and pictured below. Try running it and see how the view of blue squares at bottom animates when you change the model. Basic reference documentation for the AutoListModel is included in the Hackage documentation. The topic demands some more exposition, and will be the topic of further blog posts with some more exciting sample programs in the works. objects. * Fixed memory corruption bug prior to Qt 5.2 with workaround. * Fixed building with Fedora-style moc executable names (non-qtselect). * Fixed building GHCi objects with GHC 7.10. * Fixed missing strong reference on engine context objects. * Fixed missing include breaking compilation with Qt 5.0. * Fixed switch compiler warnings. * Fixed imports to support older GHCs. HsQML is a really great library! To quickly be able to throw together a robust GUI is important, and HsQML makes it possible for me. Thank you very much!